9x12, xvi + 134 pp. Giovanni Maria Ruggieri (ca. 1669–1714) lived and worked in Venice, and his Suonate da chiesa, op. 4 (Venice: Giuseppe Sala, 1697) is preserved in the Musiksammlung of the Österreichische Nationalbibliothek, Vienna. Although Ruggieri remained an amateur musician, this set of sonatas shows that he was a highly accomplished composer. 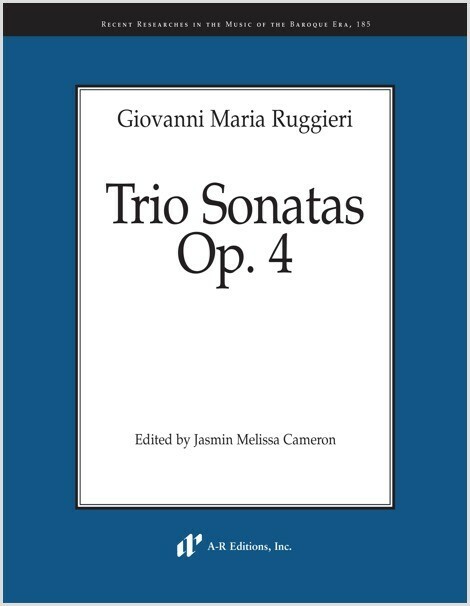 These trio sonatas comprise different styles. Faster fugal movements that accommodate passages of idiomatic instrumental writing are placed alongside more solemn slow movements, saturated with musical-rhetorical figures and, on occasion, stile antico writing. Dance style is merged with the learned style, and the musical quality is remarkable. The present edition enables musicians to explore these fine works, contributing to an understanding of the da chiesa repertoire in late-seventeenth-century Italy and aiding the rediscovery of an unjustly neglected composer.